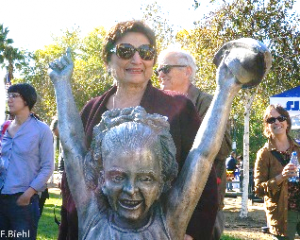 An amazing civic leader who dedicated a big part of her life to community, Shirley had a special place in her heart for Downtown San Jose Arts, Guadalupe River Park & Gardens and the Rotary Club of San Jose. These passions fused when she launched the Rotary Sculpture Walk during her term as Rotary President. You are invited to participate in this great project to honor Shirley’s memory. 100% of all donations will go to the GRPC, and are charitable contributions. Any remaining proceeds will be dedicated to the maintenance and upkeep of the Shirley Lewis Rotary Sculpture Walk and Shirley’s other passion at the GRP, the Rotary PlayGarden. During her term as President of the Rotary Club of San Jose, Shirley had a vision of drawing families with children to and through the GRP for a special experience through art. She knew the importance of public art to a strong downtown, and wanted to create a destination for people to visit. Shirley’s vision became a reality. 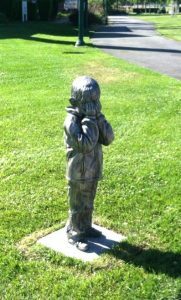 The first group of statues – cast aluminum figures created by San Jose State University Foundry artists – depicting children playing hide-and-seek and pointing skyward at airport-bound airplanes while launching a paper plane of their own have been a real wonder and discovery for children. 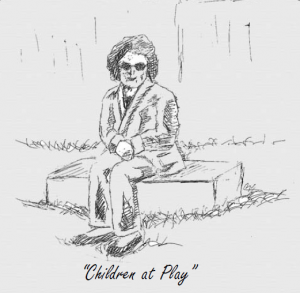 The Children at Play sculptures provide the reminder Shirley wanted for people to appreciate their surroundings and remember the excitement of childhood. They also pay tribute to the business life and activity in the Bay Area, as well as, emphasize the city’s commitment to community and family. The Rotary Children at Play Sculpture Walk was a collaboration between the Rotary Club of San Jose, Guadalupe River Park Conservancy and San Jose State University Foundry. This tribute to Shirley will give her the best seat in the park, peacefully watching over all of her Children at Play. Shirley will be sculpted by the very artists at the SJSU Foundry that she and her team worked with to develop the first sculptures in 2011-2012. Shirley crafted the whole concept of this wonderful sculpture walk, and the importance of the link with the SJSU Foundry. A comprehensive YouTube video of the sculpture walk is available here. For locations, download this map, or stop by the Visitor Center to pick up a copy.